In the name of frugality and using up what I had on hand, I also bound the placemats in the heavier weight fabric, which was a bit of a challenge. Thicker fabric meant that getting the binding turned around the edge was a bit bulkier, but I think they turned out well enough. I thought that this striped print with gray, yellow, light blue, and white coodinated pretty well, and I had these made in 2 hours. As you might be able to tell in the photos, the placemats have already gone through their first wash and have finished at 12-inches tall by 18-inches wide. 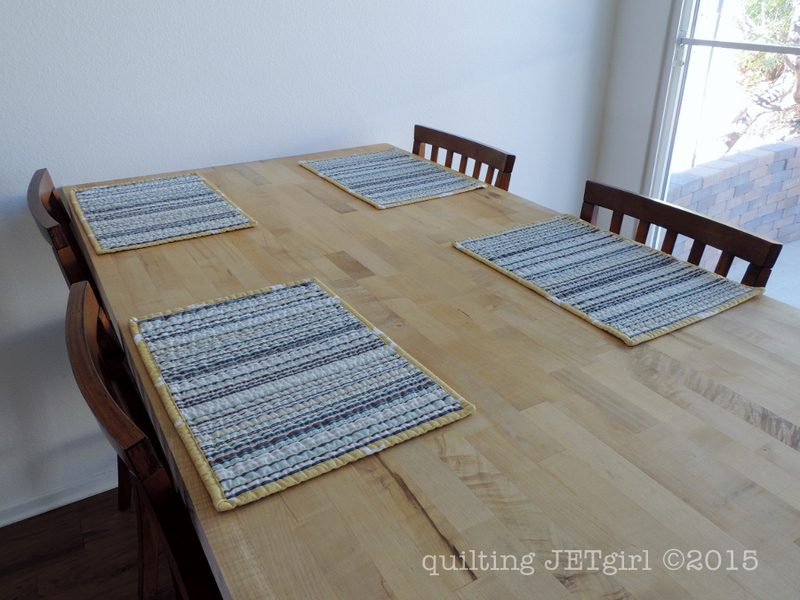 I quilted the placemats with 50wt Aurifil 2021. The quilting went really fast because I just loaded the fabric whole cloth onto my long arm and I trimmed the placemats out after quilting. Have you ever accidentally purchased a heavier weight fabric? What did you do with it? I had to smile. Yes I guess we’ve all bought thicker cotton than we intended. Mine was selected for a sew together bag by one of the children for his pen case for school. It worked really well, much better than the more floppy version using ordinary quilting cotton and fusible wadding. I’ve done that once, too! It’s still sitting in my stash. 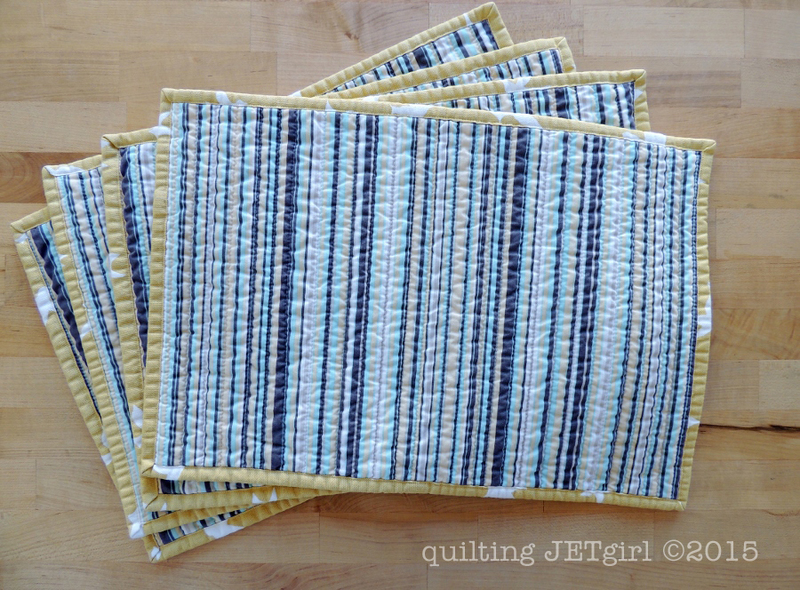 Placemats are a good idea, although I probably don’t have enough yardage for many. I’ll check, though! Thanks for the inspiration! I accidentally ordered a flannel that I thought was a quilting cotton. It’s still in my stash (a year later), though I plan on making rice bags with it to act as heat pads. We’ll see if I ever get around to it! They look great. How do you do straight lines on the long arm? Yes, what I thought to be Quilting Cotton was actually Canvas. Oops! I made pillow covers. Cute Placemats. You make the best placemats Yvonne. the bird fabric is very pretty. I pulled the same oops when I bought my fabric for the Midnight Mystery quilt. I thought I was ordering a quilting weight from Hawthorne Threads, when it turned out to be a home decor weight. 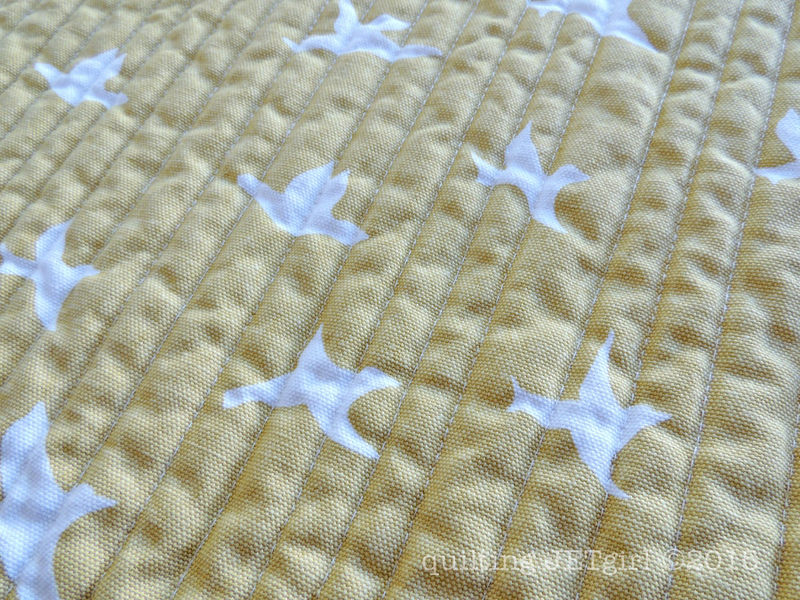 So I re-ordered a different fabric and now have it washed up and ready to cut and start my flying geese. Oops or not, you made something out of ‘lemons’! I have purchased the wrong thing a time or two ~ one of the pitfalls of online ordering! I said I wouldn’t make that mistake again, but I have! I have done it once or twice, they heavier duty fabric turned into pouches and a new purse so it is a happy mistake. I am more likely to buy fabric and get home and decide it is too sheer. I’ve had the suggestion to back it , but haven’t. I plan to use it as the base of string quilt blocks or nightgowns. Up to gaberdine weight, I just put into quilts. From the old days when, if you wanted solids, you pretty much took what the store had. Prewashing helps not to have to deal with different rates of shrinkage. 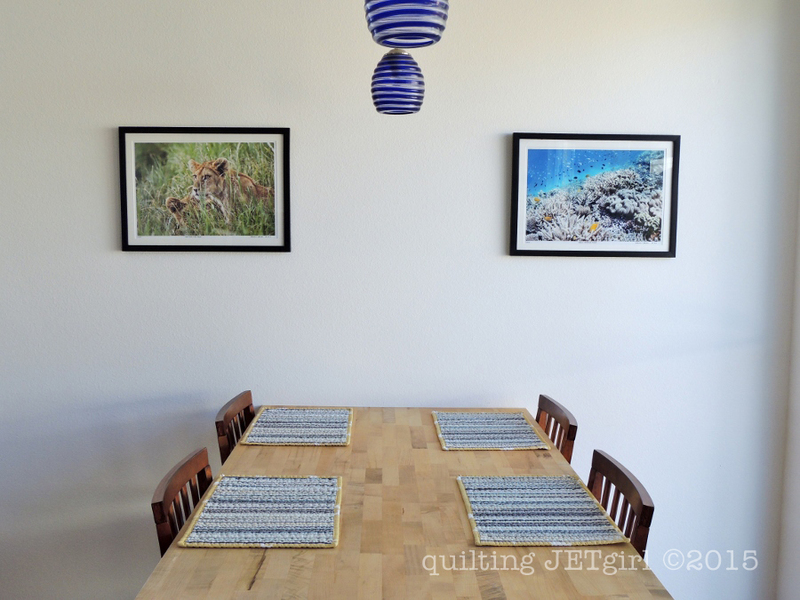 I love the bird fabric print, and they do make nice placemats! I use heavier weights for bags. 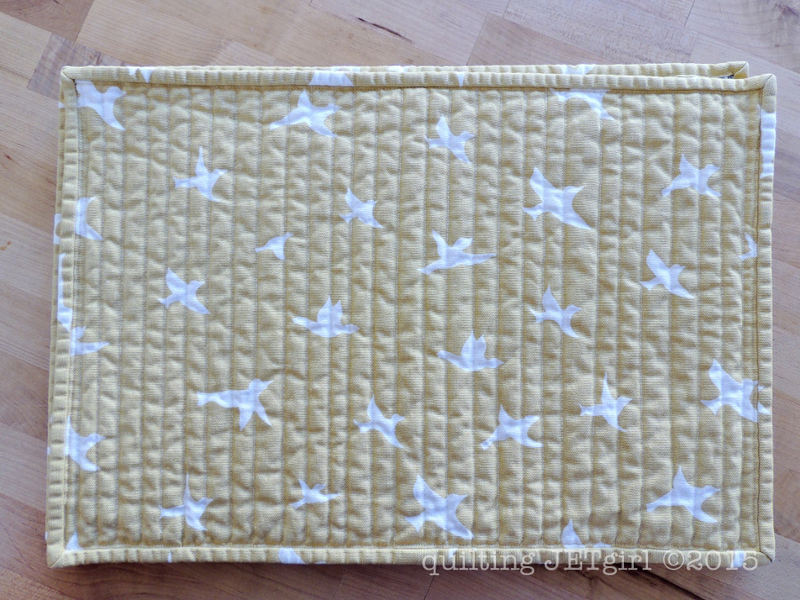 Yvonne–quilting the sandwich than making the placemats–BRILLIANT! Love how the fabrics ended up, too! I haven’t accidentally bought heavier fabric, but I have a growing pile I need to make into bags and the like. Did you make the binding single thickness to help with the bulk? I haven’t had that oops happen yet. I like how you turned lemons into lemonade. Great idea to use up the fabric. I would probably use the heavier weight in a bag. That’s a great idea to do them whole cloth and then quilt them after! Would make a great gift. I like heavier fabrics for making bags, they add stability and make them more durable. Never got fabric accidentally that way, but frequently pick up different weights thrifting, if it’s a good design/colour/pattern (and a bargain) then I’m never disciplined enough to leave it on the shelf! Always good for something, and as long as the weights aren’t too extreme I’m not averse to mixing them in a quilt either, I’m obviously not a purist! Great idea to cut these after quilting, I’m guessing there are ways to plan to do that even with patchwork mats too.